Home » NEWS » STOP THE FDA! The Cigar Rights of America has started a petition asking Congress to exempt premium cigars from the FDA’s over reaching regulations. You can sign that petition by clicking this link. There is a White House.gov petition asking the President not to enact the FDA’s Option 1 on Premium Handmade Cigars. You can sign that petition by clicking this link. All these rules take effect on August 8, 2016. The FDA has given current cigar manufactueres, importers and distributors 2 years (2 1/2 year if your company has less then $5,000,000 in sales) to submit the paperwork and cigars you currently have on the market to them for market analysis. The FDA then has up to 1 year to complete the analysis & decide if your product can be marketed to the US consumer. If a cigar product has not been given approval by this time, then it must be removed from the shelves of retailers. Another part of these regulations are the limits placed on marketing the cigar products. Included in this group of regulations are the “No Free Samples” rule. It means exactly what it says. Cigar manufacturers and retailers will no longer be able to give a consumer free samples of their products. What this means for you, the consumer, is that many of your favorite brands or in some cases, many favorite vitolas will cease to exist. The FDA has stated in their press releases that their goal is to prevent smoking by youths under the age of 18. In reality, their goal is to create a tobacco-free United States. This is an important distinction. They hope that by making the cigar industry so onerous and heavy with paperwork & regulations, they can eliminate it altogether. There is now only 1 way to halt the FDA. We must come together & insist that our premium cigars are not being marketed to children. 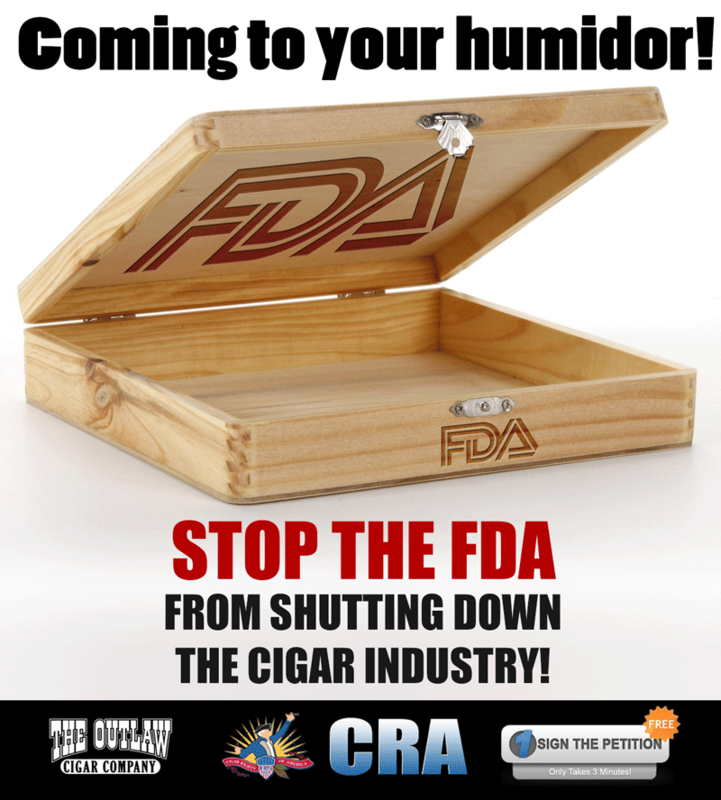 We must show what the FDA is really about in regards to regulating cigars. We must ask our Congressmen/women and US Senators to enact legislation to either exempt premium cigars from these rules or at the very least, change the grandfather date from February 15, 2007 to the date that the rules will be enacted – August 8, 2016. Read the Full FDA Regulations & Learn More by clicking this link.